The cache is not at the above location but good free car parking local to the Cathedral is usually fairly busy and a limited stay of 2hrs. Ok 15 Church Micros to find and two needed to gather the information required to locate this one. See Puzzles below. All you need is to answer two questions from my other CM locations and figure out the calculation required. 1. Church Micro 1437…Cheddar here the date = AB, month as a figure C, year DEFG. N 51° 12. (A+C)KM W 002° 3(G-D).(J+F)IB. it's a small the best size I can get to fit in the final location area. There is a picture frame attached to the cache the FTF will have their name etched here for all time. 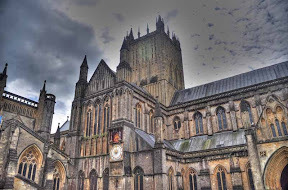 There is also a rare (ish) postcard enclosed in the cache to make it a little special please keep it in the cache for other finders to see ( I was hoping to use a Wells Cathedral one but I have temporarily miss placed it), it is not a swap thanks. So on to the Cathedral description. The first church on the site was established in 705. 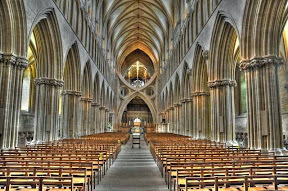 The present building, dating between 1175 and 1490, has been described as "the most poetic of the English Cathedrals". It is moderately sized among the medieval cathedrals of England, falling between those of massive proportion like Lincoln and York, and the much smaller Oxford and Carlisle. With its broad west front and large central tower it is the dominating feature of its small cathedral city and is a significant landmark in the Somerset countryside. 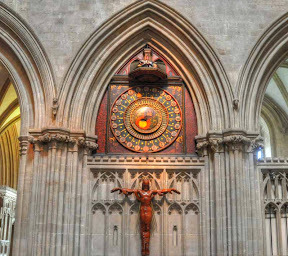 The architecture of the cathedral presents a harmonious whole, being entirely Gothic and mostly in the Early English style of the late 12th and early 13th centuries. 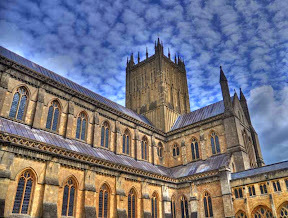 While the majority of the current structures of the English cathedrals were started in the Norman period, Wells Cathedral was the first that was begun as a Gothic design. 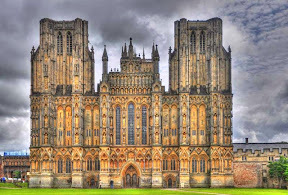 The choir at Wells is considered by John Harvey to be the first truly Gothic structure in Europe, having broken from the last constraints of the Romanesque style. The stonework of its pointed arcades and fluted piers is enriched by the pronounced mouldings and the vitality of the carved capitals in a foliate style known as "stiff leaf". The exterior has a fine Early English façade with more than three hundred sculptured figures. Internally the eastern end has retained much original stained glass, rare in England. 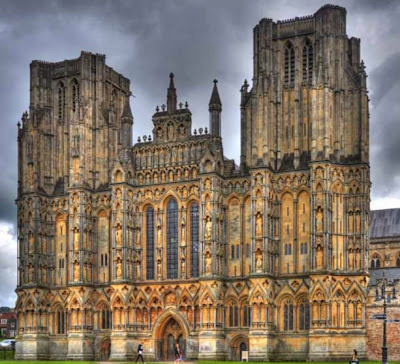 Unlike the many English cathedrals of monastic foundation, Wells has retained an exceptional number of buildings associated with its chapter of secular canons: the Bishop's Palace and the Vicars' Close, a residential street which has survived intact from the 15th century. The cathedral is designated by English Heritage as a Grade I listed building, and Scheduled monument. Juvgr Yvzr fgnvavat gur fgbar nebhaq n abbx. Cyrnfr chfu onpx va nf sne nf lbh pna. Gur pb-bqf ner ba gur pnpur cntr ahqtr ahqtr vg'f whfg svaqvat gurz! (frr urer uggc://pbbeq.vasb/TP25JDW gryyf lbh ubj va gur 9gu cnentencu "Nabgure pbzzba jnl") Fb lbh qba'g npghnyyl unir gb ivfvg nal bs zl bgure PZ'f. Ohg V erpbzzraq lbh qb bs pbhefr.